Every day is pretty much the same until a bit of “something” is found in the vast emptiness and the king is thrown into a spin. What to do? Even though the “something” that appears in his empty kingdom is very small, it is worthy of enormous scrutiny by this king of orderly sameness and Mimo the First promptly has it thrown into the dungeon where he doesn’t have to worry about it anymore. Out of sight does NOT mean out of mind, however, and the king does worry what this change in his domain can mean for the kingdom. The more he worries, the madder he becomes, but when he finally goes out to confront the “Something” it’s gone. Another change! When the Something does appear again, it’s larger and when he shakes it, more somethings are rattled loose and scattered about, filling up his empty kingdom of nothingness and changing it forever. The appearance of the book is dingy and dirty looking on the outside and the pages of Guridi’s work are quite literally filled with emptiness and vague lines and shapes hinting at objects that occupy the Kingdom of Nothing. 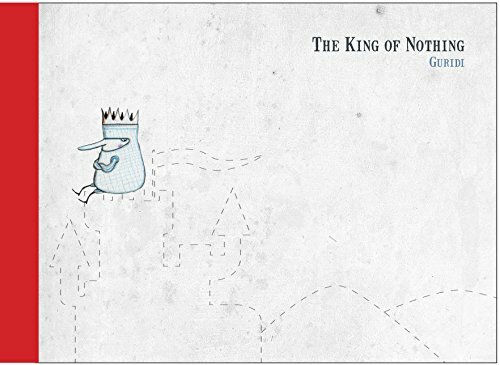 While the muted gray of the background lends itself well to the appearance of “nothingness,” there really is only the image of the little king to keep you interested . . . until the “Something” appears as a tiny bright red seed and the final page of beautifully illustrated flowers. This witty analogy of dealing with change does not transfer well to an illustrated storybook for young children. The bold all-caps font of the text and the lack of punctuation create an almost “shouted out loud” tale. And the charming King Mimo the First is sometimes just a tiny smear of color on a vast empty page of nothingness that leaves you wanting to see more. But then again, maybe that’s the whole point. Lisa Gammon Olson's most recent book from her American Herstory Series is Sewing the Magic In (Eifrig Publishing, 2018). A previous title, Dust Flowers (Eifrig Publishing, 2017) is a finalist for a 2017 Foreword Indie Award for Best Children's Picture Book. Her third book in the series, The Cheese Song, will be out this summer. She works in an elementary school where she is always surrounded by children and books.